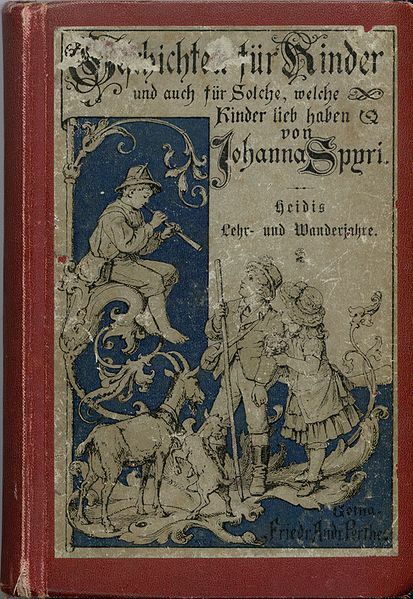 Heidi, her years of wandering and learning; a story for children and those who love children was written by Swiss author Johanna Spyri (12 June 1827 – 7 July 1901) in 1880. The book is about a little girl Heidi, who lost her parents and was taken under the care of Aunt Dete. The story tells her life on the Swiss Alps with Aunt Dete and her family, her secluded grandfather, the illiterate goat-herd Peter and the disabled Klara. UP TO THE ALM UNCLE. Where the path begins to grow steeper, begins also the heath with its short grass ; and the perfume of sweet mountain plants seems to advance as if welcoming the traveller. From this spot the footpath rises almost perpendicularly to the summit. reached her native villagre. She did not, however, pause at all, but answered all questions and greetings as she went along, till they reached the end of the hamlet, where only a few scattered cottages stood. “ Wait a minute, Dete, I will go with you if you are going farther.” As Dete stood still, the child freed herself from her grasp, and seated herself upon the ground. “Are you tired, Heidi?” asked her companion, ” No, but hot,” replied the child. ” We are almost at the top. You must exert yourself a little more, and take very long steps, and in an hour we shall be there,” said Dete encouragingly. A broad, good-natured-looking woman came from a doorway, and joined the pair ; and the little one followed the two old acquaintances, who were deep in conversation about the inhabitants of Dorfli and the surrounding cottages. “To Frankfort,” explained Dete, “where I am promised an unusually good place. The family were at the baths last summer. ” I should not like to be in this child’s place,” said Barbel, with a gesture of aversion.. But Barbel had long wanted to know why the Alm uncle had such a look of dislike to other people, and why he lived alone up on the mountain; and why people spoke so cautiously about him, as if they could not say anything favorable, and would not speak against him. Neither did Barbel know why the old man was always called in Dorfli the Alm uncle. He could not be the real uncle of all the inhabitants ; but as they always called him so, she did the same. Barbel had only been married a short time, and came to live in the village after her wedding. She formerly lived in Prattigau, and therefore did not know all the ins and outs of the life there, nor the peculiarities of the people in Dorfli and the neighborhood. Her good friend Dete, however, was born in Dorfli, and had always lived there with her mother until her death ; then she went to Ragatz Bad, and served in the big hotel as chambermaid, with very good wages. ” Well, I will ; but mind you keep your word,” said Dete warningly. She turned to look behind, to see if the child were near enough to hear what they said, but Heidi was nowhere to be seen. She must have ceased following for a long time, but they were too busy talking to notice her absence. Dete stopped, and looked about in every direction. The path made one or two curves, but yet the eye could follow it almost down to Dorfli. There was no one visible for its whole length. She is climbing up the cliff with Peter the goatherd and his flock. ” Used he to have more ? ” asked Barbel. ” He ? Yes, indeed ; he had much more, formerly,” replied Dete eagerly. ” But what happened to Tobias?” said Barbel, who had listened eagerly. ” Only wait, I am coming to that ; I can’t tell everything at once. ” Tobias was sent to learn his trade in Mcls ; and when he had learned it he returned to Dorfli, and married my sister Adelheid, whom he had always liked. And when they were married, they got along well enough together ; but that did not last long. Two years after his marriage, as he was helping to build a house, a beam fell on him, and killed him, and he was brought all crushed to his home ; and Adelheid fell ill from the shock and from sorrow, and had a fever from which she never recovered. She, who was formerly so strong and hearty, fell often into swoons, so that one could not tell if she were waking or asleep. Only two months after Tobias’s death we buried Adelheid. Everybody was talking far and wide of the sad fate of these two and they said softly, and then aloud, that it was the punishment that the uncle deserved for his godless life ; and the pastor, appealing to his conscience, told him that he must now do penance : but he became more and more gloomy and morose, spoke to no one, and at last every one avoided him. Then we heard that he had gone up on to the Alm, never coming down, but living a solitary life, at war with God and man. ” And you will leave the child up there with that old man ? I cannot understand what you are thinking of, Dete,” said Barbel reproachfully. in the sheltered hollow, and yet looked so crazy and weather-worn that it must have been a dangerous dwelling when the Fohnwind blew strongly over the Alm, making everything shake and tremble, and setting- all the rotten beams a-creaking. It could not have stood long, in its present condition, on the summit, but would speedily have been swept down into the valley. This was the dwelling of goat- Peter, the eleven years old boy whose business it was to drive the goats from Dorfli. every morning, up on to the Alm. to let them pasture on the short, succulent bushes that grow there. In the evening he led his nimble- footed herd down into Dorfli again, gave a shrill whistle on his finofers, at the sound of which the owners came to the little square to fetch each his own goat. Generally little boys and girls came for the animals — such gentle creatures could do no harm — and thus Peter was for a short time every day with companions of his own age ; otherwise he lived during the entire summer only with his goats. To be sure, he had his mother and his blind grandmother ; but he left the hut early in the morning, and returned late at night at Dorfli, because he liked to amuse himself with the children there as long as possible, spending only enough time at home to swallow his bread and milk as fast as he could, to get off early with the goats in the morning, and to his pillow at night. direction ; for Peter knew of many spots where all sorts of bushes and herbs grew that were good for his goats to nibble at, and to reach which he twisted and turned about from one place to another with his flock. At first the child climbed after him, but with the greatest difficulty. Enveloped as she was in her heavy wraps, and suffering from their weight and moreover from heat, she was obliged to exert all her little strength. She said nothing, however, but looked now fixedly at Peter, who, with his bare feet and light trousers, sprang here and there without the least trouble ; now observing the goats, which, with their thin, slender legs, climbed still more easily over the stocks and stones, and even up the precipices. Suddenly the child sat down, pulled off shoes and stockings as quickly as possible, stood up again, threw off the thick red shawl, unfastened her dress, cast that away, and had still another to strip off; for Dete had put on all the child’s Sunday clothes over her every-day garments, for convenience’ sake, so that no one else need carry them. In a twinkling the child tore off her every-day dress too, and stood in her light petticoat, and stretched her bare arms with delight out of the short sleeves of her little shirt into the cooling wind. Then she folded all her clothes together into a neat little heap, and leaving, climbed up after the goats to Peter ; going with them as lightly and easily as the very best. Peter had not noticed what the child was about while she stood behind ; but when she sprang up beside him in her new dress, he grinned in the most comical way; then, looking back, he perceived the little heap of clothes, and his grin became wider, until his mouth seemed to extend from ear to ear ; but he said never a word. Now that the child felt herself so free and comfortable, she began to talk to her companion, and he had to answer all sorts of questions. She wanted to know how many goats he had, where he was taking them, and what he did when he reached his destination. At last, however, the children and the goats reached the hut, when Aunt Dete caught sight of them. The child pointed quietly down the mountain-side, saying only, “There.” Dete looked ; and following the direction of the child’s finger, certainly, down there she saw something lying, on the top of which was a red spot. Could that be the shawl ? ” I do not need them,” replied the child, and did not look sorry for what she had done. ” I am too late already,” said he slowly, and stood without stirring from the spot, with his hands in his pockets, just as he stood when Dete’s cry of alarm first reached his ears. In an instant he ran down the mountain, taking the shortest way, and reaching the clothes by great strides, seized them in his arms, and was back again so quickly that Dete was forced to praise him, while she gave him the promised five-cent piece without delay. Peter stuck it quickly deep into his pocket, while his face beamed and shone with pleasure ; for a like treasure rarely fell to his lot. ” You can carry the bundle for us up to the uncle’s, you are going that way, I believe,” said Dete, while she applied herself to climbing the steep path that made an abrupt ascent from behind the goatherd’s hut. He was quite ready, and followed her, carrying the bundle under his left arm, while he swung his rod with his right, Heidi and the goats sprang joyfully about in every direction. Behind the hut stood three big, very old pine-trees, with long, thick, untrimmed branches ; and then the mountain background rose up, up to the old gray rocks, first over beautiful slopes covered with succulent herbs, then through thickly Strewn bowlders, and at last came the bald, steep pinnacles. On the side of his hut overlooking the valley, and fastened there securely, the uncle had placed a bench. Here he was now seated, his pipe in his mouth, his hands resting on his knees, looking quietly down at the children, the goats, and Aunt Dete, as they came clambering up. ” Well, well, what does this mean ? ” answered the Alm uncle harshly; gave his hand, however, to the child, looking at her with a long, piercing gaze from under his bushy eyebrows. Heidi returned his look with equal steadiness, not once letting her eyes swerve from his face. Such a strange-looking man as her grandfather, with his long beard, his gray eyebrows growing together in the middle like a bush, seemed to her worthy of study. In the mean time Dete and the goatherd stood beside Heidi, Peter looking on to see what was to happen. Peter heard, and obeyed ; for the uncle had looked at him, and that was enough. ” The idea of leaving such a helpless child up there ! ” and again and again, “The poor little tot!” and soon, and so on. Dete ran on as quickly as possible, and was soon beyond the reach of their voices ; for she was not happy about her conduct, as her mother had given the child into her charge on her death-bed. But she tried to quiet her conscience by saying to herself that she could do more for the child when she had earned something ; and she was glad to get away as quickly as possible from her old friends, who questioned her too closely, and to go into service with a good family.